Rain falls through suffocating humidity, forming deep, wide puddles at the corners of Florida Field. The Gators score a touchdown. And then another, and another, until the noise from beneath the umbrellas and ponchos begins to sound like the ceaseless roar of traffic. On the visitors' sideline, Tennessee's sophomore quarterback, Peyton Manning, sits on a metal bench, hair matted to his forehead, anger fixed on his soft face. He had opened his life to a reporter in the week before this embarrassment. The story was supposed to be about his preparation for a game, about how he started on Monday morning with a weight workout in the predawn darkness and then went straight to calculus up on the Hill, a cluster of classrooms that many Vols athletes avoid because it's too far from the sports facilities. It was supposed to be about how he studied game film every afternoon and evening and did more interviews than the rest of his teammates combined. About how when he arrived at English class on Thursday morning, two women in the class asked him to help them distill the plot of The Awakening because he had read the novel and they hadn't. About how he seemed to fit the forgotten image of what a college athlete could be. That afternoon in Gainesville, Manning walked from the floor of the stadium and paused in the tunnel outside the locker room. There, he embraced his father, who whispered to him, "We're proud of you." Then Peyton clattered away. In the wake of this devastating loss, there would be no story. Eleven months have passed and another college football season beckons. Peyton Manning is the player of the year before the first ball is snapped. He holds in his 20-year-old hands the dreams of Tennessee football fans, who desperately want an SEC title and the Volunteers' first national championship since 1951, and who want to see Manning become the school's first Heisman Trophy winner. He is also some NFL team's living fantasy, a 6'5 1/2", 223-pound once-in-a-decade catch who might enter the draft after this, his junior season. "He's the first pick," says the New York Giants' director of college scouting, Tom Boisture. "Last year, this year, next year, whenever he wants." Manning is in a magical place, soon to be a wealthy professional, but for one more year he is a throwback, living an ideal. Now there is a story. It begins in the fourth game of Manning's freshman season, when he becomes the starting quarterback after injuries to two upperclassmen. The Volunteers would go on to win 18 of 20 games with him as the starter. Last season they finished 11-1, ranked No. 3 in the country, as Manning threw 380 passes and had just four intercepted. "Here's the way I look at it," says Mississippi State defensive coordinator Joe Lee Dunn. "Florida's Danny Wuerffel is a good college quarterback. Peyton is a good pro quarterback. Right now." When NFL scouts make their spring pilgrimages to college campuses, they are supposed to evaluate only seniors, but when they came to Knoxville a few months ago they couldn't help but be distracted by a sophomore. San Diego Chargers quarterbacks coach Dwain Painter not only noticed Manning--"I had already heard our scouts raving about him," says Painter--but also approached him to ask about several of Tennessee's seniors. Who would know them better than their quarterback? In return, Manning grilled Painter. Having just studied a tape of the Miami Dolphins' playoff loss to the Buffalo Bills, Manning was curious about the coverages that had seemed to confuse Dan Marino. Painter was taken aback. Such inquisitiveness is not normal in a player so young. College quarterbacks normally ask about meal money. Says Painter, "After talking to him, it's obvious he's way ahead of most young quarterbacks." Last February, Manning attended the banquet for the Davey O'Brien Award, given annually to the quarterback voted best in the nation by a panel of sportswriters. Wuerffel won; Manning was a finalist. Runners-up seldom attend the ceremony, but Manning went to Dallas with a purpose. At a reception for past winners, Manning worked the room for tutelage--from the Philadelphia Eagles' Ty Detmer ("I wanted to talk to him about the West Coast offense he played under in Green Bay, and because I knew his father coached the passing game in high school and because he went to Brigham Young," says Manning), from the Carolina Panthers' Kerry Collins ("Because he was a rookie last year") and from the San Francisco 49ers' Steve Young ("He was surrounded the whole time, but I told him I'd love to pick his brain sometime"). Not a moment of idle chatter. "I figured I had two hours with those guys," says Manning. "I wasn't going to waste it by making small talk." This surprises no one at Tennessee, where Manning has flabbergasted teammates and coaches with his work ethic since the summer of 1994. "He came in with an attitude that I've never seen in any freshman," says fifth-year senior fullback Eric Lane. Manning went to Knoxville six weeks earlier than most other freshmen to acclimate himself to the football program and participate in workouts with older receivers and running backs. "He wanted to get as much work done as possible, every day," says Lane. Here's the way I look at it, Florida's Danny Wuerffel is a good college quarterback. Peyton is a good pro quarterback. Right now. Tennessee coach Philip Fulmer remembers a practice last fall when the team was doing a blitz-pickup drill, in which offensive linemen and running backs work on blocking. "There are no receivers in the drill," says Fulmer. "All the quarterback has to do is take a snap and drop back to give us the proper depth. But here's Peyton coming up to the line, giving signals to receivers who aren't out there, doing his checks, dropping back full speed, setting up...and there's nobody out there. All the coaches were laughing, but that's the way he lives his life. Peyton lives to be better. He's like the coach's little son who's 5'9" and can't break an egg when he throws--except Peyton is 6'5", with a world of talent." In his sophomore year at Isidore Newman, the private school in New Orleans that he attended from kindergarten, Peyton first quizzed his father about studying game film. This was logical, because his father, Archie Manning, played quarterback in the NFL for 14 years. Archie didn't push his son to study film then; the quality of tapes from high school games wasn't very good anyway. But two years later, when Peyton expressed an interest in perusing some NFL game films, Archie told him, "If you're going to watch film, do it the right way." By that he meant, Don't watch the ball, watch the defense; fans watch the ball. With this tiny piece of advice Archie helped create a monster who watches more videotape than Bob Saget. Reporters have phoned the Volunteers' film room late at night in search of offensive coordinator David Cutcliffe and instead reached Manning. Pizzas have been delivered to the film room so that Manning could eat a midnight meal while breaking down Alabama's goal line defense. Cutcliffe has done extra work on the weekends lest he be caught unprepared at Monday afternoon's quarterbacks meeting. "I know he's going to have a bunch of questions right away," Cutcliffe says of Manning. "He's somebody very special, and I don't want to let him down." During his freshman year Manning was so eager that he couldn't keep himself from jumping on all queries made to Cutcliffe. One day Helton (who was selected as a first baseman by the Colorado Rockies in the first round of the 1995 baseball draft) lost his temper. "Peyton, don't answer my questions!" he shouted. Last September, in the six days leading to Tennessee's drubbing by Florida, Manning watched more than 20 hours of tape on his own. In February his apartment mates moved Manning's VCR to the living room. "We figured maybe we could bring dates over and watch movies," says Vols senior linebacker Greg Johnson, one of Manning's best friends on the team. "That lasted maybe a month." The VCR was moved back to Manning's room. By the summer of '95, Manning was organizing the informal passing drills that he had crashed the previous July. He left messages on the answering machines of wideouts and defensive backs. "It was tough for me, adjusting to his work ethic," says senior wideout Joey Kent, who caught 69 of Manning's passes last season, nine for touchdowns. "He was so young." Over time, Manning has only tightened the screws. This year he began coordinating workouts in January, only days after the Vols' 20-14 Citrus Bowl win over Ohio State. Often he would gather a dozen teammates in Tennessee's field house, only to find the baseball team practicing there. The ballplayers gave Manning 15 yards to work with--it was their season and their practice, after all. Manning took their 15 and raised them 10, until defensive backs were bouncing off infielders. Turf skirmishes ensued. Finally athletic director Doug Dickey confronted Manning and said, "Peyton, give way." It was like telling Larry Bird not to shoot jumpers after practice. "He's telling me I can't come out here and throw," says Manning. "Well, I don't want to push it, but I stuck my opinion in there. We threw for 3,000 yards last year, completed 64 percent, because of what we were doing in January and February. You ask some quarterbacks, 'Hey, you been throwin'?' They say, 'Yeah.' Well, their idea of throwing is two quarterbacks playing catch. My idea is getting receivers and defensive backs out here. Something tells me it hasn't been done much here before, and that's why there was controversy." It is not the first time that Manning's hypercompetitiveness has led him to cross an athletic department official. In his junior year of high school, after Manning made his annual transition from football to basketball (before going on to baseball in the spring), Newman basketball coach Billy Fitzgerald chose not to start him. Fitzgerald, a tough, successful coach who posts aphorisms by Bob Knight on the walls of his office, didn't think Manning was ready. Manning thought he was, so the two argued. The team's sixth man as a sophomore, Manning left the basketball team by mutual agreement. "It was typical of Peyton the competitor," says Fitzgerald. "I don't fault him for it. It was a privilege to coach him." On the morning that Manning signed with Tennessee, Fitzgerald was the second person he called. "He taught me about toughness," says Manning. The payoff has been extraordinary. Manning's preparation has turned the college game into a plaything for him. Last Oct. 7, Dunn, then the defensive coordinator for Arkansas, which would win the SEC's Western Division, threw everything but Nolan Richardson's 40 Minutes of Hell at Tennessee. Manning completed 35 of 46 passes for 384 yards and four touchdowns in a 49-31 victory. "We tried to make it complicated for him," says Dunn. "And he handled everything. He's really good." It is Manning's mind that NFL teams covet most. As the pro game has become more complex, it has become more difficult for young quarterbacks to excel. "I don't think there's ever been a quarterback who has been as prepared, mentally, as Manning is," says one NFL personnel director. But some of his physical attributes and tools are ready for the pros, too: the height, the quick release. Bobby Beathard, general manager of the San Diego Chargers and an old friend of Archie's, called Archie one night last winter. "I was just watching the Tennessee-Alabama tape," said Beathard, who was evaluating an Alabama defensive back. "Tell me, how does your boy get rid of the ball so fast?" The scouts whisper about Manning's weight and his arm strength, but most haven't seen him since last fall. He has gained nearly 10 pounds. He can squat 400 pounds and bench 315--a vast improvement from his freshman year. "The idea that Peyton is just this mental machine is way off," says Cutcliffe. "He's got that, but he's got quick feet, great balance, velocity on the ball." There is little doubt about Manning's future. The questions are about details: how many dollars over how many years, paid by which NFL team and when? A speech communications major with a minor in business, Manning has a 3.58 GPA and is on course to get his degree as early as next summer. If he leaves Knoxville after this season, he will have given Tennessee three years, 28 to 30 wins, 20 home sellouts and maybe that first Heisman. His would probably be about the most logical early departure in history. But, he says, "I've done crazier things than stay four years at Tennessee. Like coming to Tennessee in the first place [instead of going to his dad's alma mater, Mississippi]. All I know is I'd like to play this fall without looking one day ahead." His passion doesn't flow from the promise of NFL stardom but from his vision of college football as a pristine institution. He lives for Saturdays, not Sundays, because he grew up the son of Archie Manning, who--before he was the beaten, beleaguered quarterback of the New Orleans Saints, Houston Oilers and Minnesota Vikings (1971-84)--was one of college football's last great heroes. Archie went to Ole Miss in the fall of 1967 from the tiny Mississippi Delta town of Drew (pop. 2,143). By the end of his junior year he had restored the Rebels to a place among the nation's elite teams and had been hailed as perhaps the best quarterback in a national class that included Stanford's Jim Plunkett, Notre Dame's Joe Theismann, Santa Clara's Dan Pastorini and Ohio State's Rex Kern. Archie was also the object of a statewide adoration that hasn't abated 26 years later. "He was a legend, much larger than life," says author John Grisham, who grew up in Southaven, Miss. Grisham, who is six years younger than Archie, has twice invoked him in novels, putting a poster of Archie on a character's wall in A Time to Kill and naming a Supreme Court justice Archibald Manning in The Pelican Brief. Peyton immersed himself in his father's college legacy after an Ole Miss fan sent the Mannings audiotapes of the Rebels' epic 1969 upsets of Georgia and LSU. Peyton, then a junior in high school, popped the tapes into his stereo, lay across his bed and let history wash over him. He listened as his dad's offense, every member a Mississippian, was described by the play-by-play man: Manning brings 'em to the line. There's Mitchell from Columbus, Coker from Clarksdale....Manning sprints out right, throws...touchdown! Touchdown, Ole Miss! Peyton memorized the calls and embellished them: "Manning, the 6'3" Drew redhead, brings 'em to the line...."
He quizzed both his father and his mother, Olivia, the Ole Miss homecoming queen whom Archie married in 1971. They told him what college football was like, how magical Saturdays were, how they had double-dated with Archie's teammates and their steadies. Peyton embraced his father's past and formed a picture of his own future. He would be a quarterback, but not in the NFL. 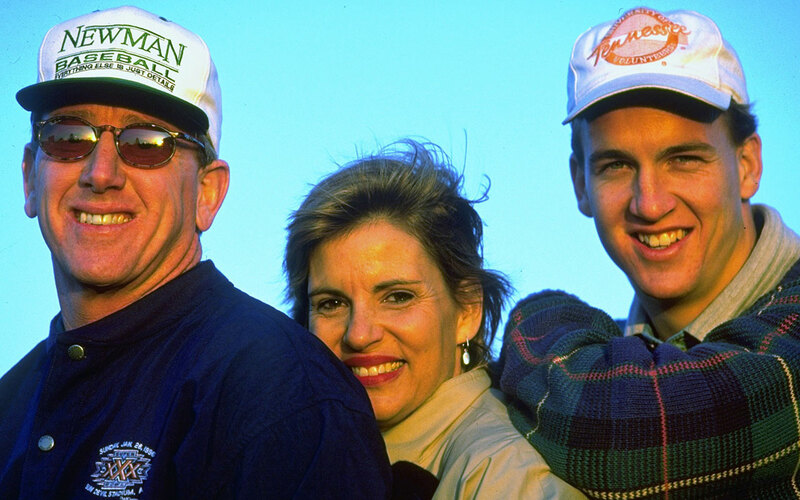 "Dad's college career was such a bright memory," says Cooper Manning, Peyton's older brother. "His pro career was...what? Guys in the Superdome with bags on their heads." So Peyton wouldn't aspire to be Marino or Phil Simms or Dan Fouts. "I never once heard him say, 'I want to be a pro football player,'" says his mother. "It was always, 'I want to play college football.'" He would be a college quarterback. In the South. Just like Archie. And if he is not quite the folk hero in the South that his father was--who could be?--he is still a celebrity. Last fall he sat in a Tennessee dorm with teammate Will Newman and student Eric Barley. Struck by late-night hunger, Barley ordered a pizza and was told the wait for delivery would be one hour. He asked Manning if he could use the quarterback's name. "Five minutes," said the pizza guy. When the pie arrived, the delivery man said to Manning, "You must sign this hat for the owner of the restaurant. Please sign it "Welcome to America, Amir." And so Manning did. In fact, his fame brings privileges Manning never imagined. On April 1 he attended a concert to celebrate the opening of the Lee Greenwood Theater in Gatlinburg, Tenn. (The invitation, unsolicited, had been delivered to Manning's apartment.) 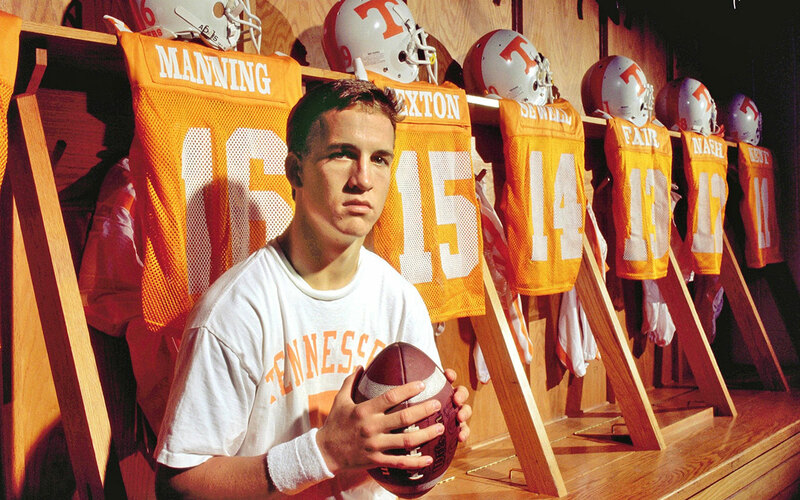 Near the end of the show, during which Manning had been introduced and serenaded with a chorus of Rocky Top, the Volunteers' anthem, a man in a suit hustled Manning to a backstage dressing room. "I walk in," says Manning, still amazed, "and there's George and Barbara and the governor." That would be former President Bush and his wife and Tennessee governor Don Sundquist. "Just the four of us," says Manning. "Next thing I know we're all posing for pictures together." He is celebrated in ways that befuddle him, such as when dozens of Tennessee families name their babies Peyton and send photos to the Tennessee football office for the namesake to see. Manning is not seeking such stardom; he is chasing an entire life--one that he has sought to re-create since he first listened to those Ole Miss tapes in high school. He can recite his father's Rebel lineups still: "Jernigan from Jackson, McClure from Hattiesburg...." When he finishes, he gives a lopsided smile, the way he does when something strikes him as sweet or funny. "I would love to have played in the '60s," he says. "Now that would have been fun." Perhaps he is playing in the '60s. His own version of the '60s. Manning may make an ideal quarterback for the mid-'90s, but in many ways he belongs on Nick at Nite. His language is a fusillade of yessirs and nosirs, each accompanied by a deferential nod. Last April, at 7:30 a.m. on the day of Tennessee's spring game, he was honored at a ceremony as the male athlete with the highest GPA in Tennessee's sophomore class. "Must be a soft sophomore class," he told the audience, holding the plaque in his hands, trying to suppress a smile. Last spring Manning did inspirational speaking engagements (for which NCAA rules forbid payment) at the buzz-saw rate of four a week. He was also chairman of the Knoxville Multiple Sclerosis Read-a-thon. "You can talk about Peyton for hours, and it sounds like some fairy tale," coach Fulmer says of his quarterback. Even Manning's mistakes are the kind that a football star from a past era might commit. Last March 5, in the training room at Tennessee's Neyland-Thompson Sports Center, he mooned cross-country runner Malcolm Saxon while assistant trainer Jamie Whited, a woman, knelt to examine Manning's right foot. The 27-year-old Whited saw what he did and felt it was directed toward her. She reported the incident to the athletic department. In punishment, Manning was made to run sprints at 6 a.m. and was barred from the training table for two weeks. "What I did lasted maybe one second, and it was not directed toward her, and there's no way I thought she could see," Manning says. "I like to play jokes with the guys. I realize now, I've got to be careful." When it comes to the game itself, however, Manning is reverential in a way that is rare among college players. On game days he sits in front of his dressing cubicle and reads the official program from cover to cover before he puts on his pads. When he meets with Cutcliffe, who graduated from Alabama in 1976 and briefly played there, the conversation turns inevitably to some slice of SEC history. "Then you see him just light up," says Cutcliffe. "For so many kids, college football is a means to an end. Peyton has a true love of college football. He knows the way Saturday afternoons are supposed to smell in the South." The smell is different now. Players are celebrated as much for their projected draft positions as for their college exploits. All the games are televised, which demythologizes the participants. The difference between Archie's era and Peyton's is only highlighted by the fact that Archie played at the smallest university in the SEC and on a team made up entirely of Mississippians. "That's how I heard college football was, listening to my parents," says Peyton. "I'm trying to get the whole experience, but the game has changed a lot. We've got guys on our team from all over the country. They're all great guys, but everybody does his own thing. It's different, that's all." And it's no reason to weep for Manning. It just turns out that in the throwback business, success is accompanied by a touch of disillusionment. "I think sometimes I talked too much," says Archie. "I never knew he was setting it in his mind that just because things were a certain way for me, they would be the same way for him. Something is missing for Peyton. He's on top of college football, and it's different from what he expected." Peyton had long imagined a route that would have brought him closer to the path that his father followed. In the fall of 1992, Cooper entered Ole Miss as a full-scholarship wide receiver. Peyton was beginning his junior year at Newman, and it was plain to see that even as a gawky teenager with a modest arm, he had vast potential. The letters from college football programs had already begun to arrive, including one handwritten by Florida State coach Bobby Bowden. Many more would follow, but Peyton had already made his decision. He would go to Mississippi, and he would play with his brother. They had always complemented each other. Cooper, two years older, was carefree and cool. Peyton was intense and serious. (The third and last of the Manning children, Eli, 15, is a sophomore at Newman, where he will start at quarterback this fall.) Cooper kissed off his schoolwork and made decent grades, says Peyton, "because all of his teachers fell in love with him." Peyton treated every class as if it were contract law with Professor Kingsfield. "Here he was, hammering away at his homework in seventh grade," says Cooper. "I'm saying, 'Relax, you don't have to stay up till 1 a.m. over this math.'" 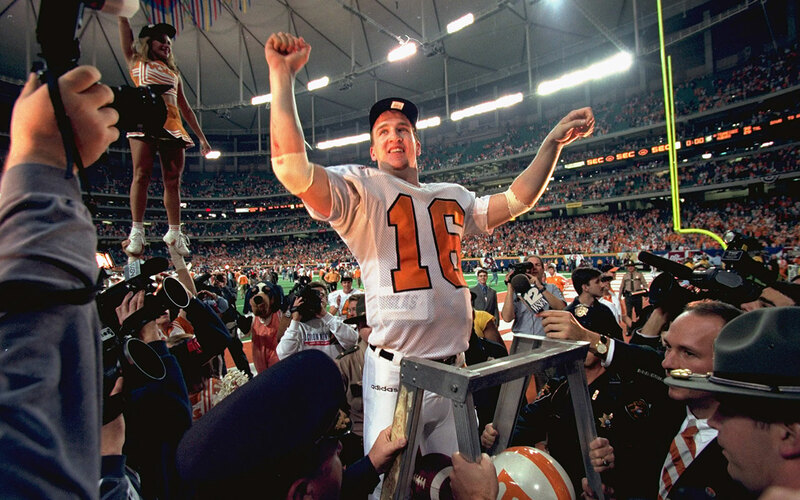 In the fall of 1991 Cooper and Peyton played their one season of football together, Peyton as Newman's sophomore quarterback, Cooper as a senior wide receiver. "That year made us buddies," Cooper says. Newman was 12-2. In the Louisiana Class 2A semifinals, against upstate power Haynesville, Newman lost 27-21 after Peyton was intercepted with 30 seconds to play. Cooper hung an arm around his little brother. Told him everything was fine. In truth, everything was not fine. Cooper had played half the season with numbness in his right hand. He went to Oxford in August 1992, participated in two-a-days and even dressed for a game. But the numbness had spread to his right leg. Archie took Cooper to specialists, and in late September, Archie was told that his son had spinal stenosis, a congenital narrowing of the spinal cavity. Football was out of the question. I would like to live my dream of playing football through you. Although I cannot play anymore, I know I can still get the same feeling out of watching my little brother do what he does best. I know now that we are good for each other, because I need you to be serious and look at things from a different perspective. I am good for you, as well, to take things light. I love you, Peyt, and only great things lay ahead for you. Thanks for everything on and off the field. In June 1993, Cooper had corrective spinal surgery that left him almost paralyzed. Three years later his right arm and leg are still weak, and he has no feeling at all in his left leg. Last spring he sat in his Oxford apartment and hit his left leg with the heel of his left hand. "Nothing. Can't feel it at all," he said. "The doctors told me after the surgery that [the feeling] would come back in two years or it wouldn't come back at all." After the operation he had to relearn how to walk. His hands had been quick and sure, but now he can't have a serious game of catch with Peyton or play pickup basketball. Cooper graduated from Ole Miss in four years and worked last fall on Rebels coach Tommy Tuberville's television show, taking a microphone into the audience like Phil Donahue. "I call him Mr. Oxford," says Peyton of his brother. Cooper has passed on to Peyton some of his roguish charm and has chipped away some of his little brother's seriousness. It was as if Cooper's blithe spirit had inhabited Peyton during the mooning incident. "Cooper moons everybody," says Peyton. Last fall Cooper attended the Ole Miss-LSU game in Baton Rouge, and when a passerby saw him walking near the stadium with a group of people, beer in hand, the guy shouted, "Peyton, what are you doing?" Cooper laughed and shouted, "Just drinkin' whiskey and chasin' women is all." Because of Cooper's injury, Peyton not only confronted what every player denies ("Football could end, so you might want to think about getting a degree along the way," Peyton says) but also began considering schools other than Ole Miss. Tennessee fit his needs best: It was in the South, it had a tradition of good quarterbacks and offensive lines, it had great facilities, and, most important, it had people with whom Peyton instantly connected--Cutcliffe in particular. When Peyton signed with the Volunteers, his parents got some vicious phone calls from Ole Miss fans, calls that hurt. Cooper, however, wore a Tennessee cap around the Ole Miss campus the day of the signing, daring anybody to rip his brother. The bond that Cooper's letter to Peyton helped forge nearly four years ago has never been stronger. The brothers talk at least twice a week, even during the football season. Peyton tells Cooper the game plans; Cooper helps keep Peyton loose. On Saturdays, Cooper usually figures out a way to get access to the sidelines and find his brother's ear. In their daydreams, Peyton sees defenses spread out before him and threads completions to Cooper through their soft spots; Cooper sees himself playing again. Each sees the other. "I always see us playing Georgia, in the daylight, always in the daylight," says Cooper. "We're driving down the field, the place is packed, Peyton hits me on a little post corner route...."
"We're both in Ole Miss uniforms, gray and red," says Peyton. "I picture how it would have been. He comes into my dream, catching a pass. Then he throws the ball up into the stands...." Touchdown! Touchdown, Ole Miss! Father and son are sitting on a couch in the den of the Mannings' yellow house in the Garden District of New Orleans. Archie is at one end, Peyton at the other, both of them signing plastic footballs to be given away at a Newman function that weekend. They also are signing other items--real footballs, hats, jerseys--that are regularly sent to the house. Their work is quiet, interrupted only by the occasional "Finished with that one?" from Archie, followed by a soft "Yessir" from Peyton. They could be brothers, and in a sense that's what they are. Brothers in history. Yes, the game Peyton's father knew has changed forever. Yes, Peyton will soon play for more money in a season than most men make in a lifetime. But this autumn can be the sweetest of all. There is a rematch with Florida on Sept. 21, a trip to Memphis 12 days later for an emotional game against Ole Miss. The national-championship game is the Sugar Bowl in New Orleans, two miles from the bedroom where Peyton listened to those scratchy old tapes. He can do things that his father never did: win an SEC title, go undefeated. "This fall," says Peyton, "this fall could be something else." In this home there is a syrupy faith, a belief that history doesn't die. "I'm telling you, college football is special," says Archie. He reaches to his left and pulls a new football from a box. He signs it and passes it to his right. Peyton scribbles his name on the ball and sets it gently on the coffee table. Archie reaches for another new football. Sunlight streams through long windows. The only noise is the squeak of a black marker against the fresh, pebbled leather.